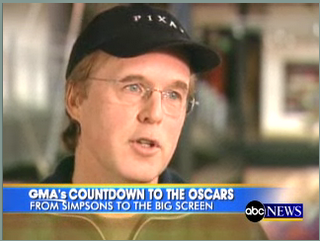 I LOVE hearing Brad Bird talk. I was just listening to the latest SplineCast with him- he obviously cares real deeply about animation and to hear him talk about it is always really inspiring. The footage from Ratatouille looks great! Thanks for posting this clip Victor. PS- If anyone has troubles viewing the video, it played 4 commercials (2 both played twice)-- but the video does come up eventually. That's what happened in Safari for me at least. You're making me even more anxious for my visit to Pixar in April, (if that's even possible :o) ! I absolutely can't wait! I'm so excited! ...I'm also learning how to run projections at the theater I work at right now... so I'll be able to run them by the time Ratatouille comes out! This is going to be the best spring ever! Can't wait to see your next tutorial! Ok, well, keep up the great work! Brad Bird is such a fantastic person - I met him twice, once at a book signing and the second time at the Annie Awards last year. He's so energetic and (dare I say it?) animated! You know he's really passionate about what he does. Those clips of Ratatoville look fantastic - it already has captivated me from just a few shots! It'll be interesting to see him make a live action film and see how that turns out!